The Impatient Crafter : My Interview with Debra Quartermain CEO! My Interview with Debra Quartermain CEO! 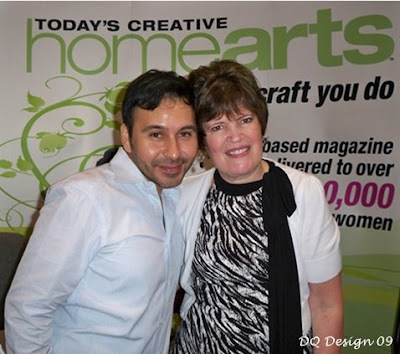 TV Host Mark Montano and Deb Quartermain at the Today's Creative HomeArts booth! I have met some amazing women working in the craft industry. Women who have reached out to me and become mentors and treasured friends. I think, if women could stop being competitive with each other and could come together towards the common purpose of creating mutual success and abundance, we could literally change the world. One woman who has inspired me endlessly with her boundless creativity, positivity and joy is Deb Quartermain. I simply adore her. She's a shining beacon of light and I'm blessed, truly, to call her friend. 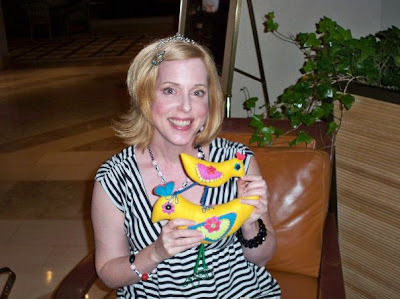 Deb (and her delightful handcrafted pals Fran and Freda) interviewed me for her CEO Blog (Creative Eternal Optimist) and she's kindly given me permission to reprint that interview here. Being creative is my life. I have been creating it since I can remember! I believe we are all of us crafting our own realities, successes, joys and also our challenges. Having a tangible way to express the creative impulse is such a powerful thing for anyone, and I'm so glad I get to do that every day in my studio. I like to think of myself as a LifeCrafterTM. I'm inventing every aspect of my reality and it's a total blast. I am a restless creative type, so I love many crafting pursuits. In fact, I can't seem to stop expanding my repertoire, even though my studio has run out of room to store the supplies! I was so happy when I first heard the term Mixed Media because it fit my creativity perfectly. I love to add a dash of this and a smidgeon of that and see what might happen. My favorite food is cheese. I also love filet mignon, crème brulee, dark chocolate with almonds, butter, cream and a variety of other terribly fattening and wonderfully delicious things. I love so many books; it's really hard to pick a favorite. My brain is my favorite craft tool. After that...I'm going to have to say my Flexible Shaft Drill. A tiara reminds me that I am divine...as is everyone. I'm a big believer in tiaras...and in self confidence. We can't expect others to hand us our joy or our success, we have to make it happen. So to me, a tiara is a symbol of our divinity and our fabulosity! My hairdresser and I work out the do and the outfits I shop for a few weeks ahead. Then I make jewelry and accessories to match. I think it's important for a designer who specializes in jewelry to be fashionable. I think it'd be hard to instill confidence in people to hire me as a designer if I didn't look like I could even design my own outfit! THANK YOU Margot! for taking the time to chat with Fran & Freda. Visit Margot Potter.com, where this best selling author & celebrity designer inspires creativity with a mix of wit, wisdom & talent! 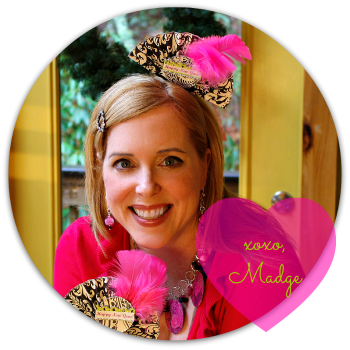 Her blog The Impatient Crafter TM is a must read and Fran & Freda are beside themselves with excitement you can purchase Margot's magnificent jewels in her own Etsy Shoppe!" What a great interview! You are such an inspiration to so many. I particularly like that you encourage us to be collaborative rather than competitive. I think there is such truth in that. I think your favorites and mine are a complete match...books, chocolate, cheese (I am from America's Dairyland after all) and flea markets. Nothing better. Thanks for this glimpse into your life, Margot! Enjoy the day! great interview. I echo your thoughts of Debra. She is just the best! Those birds are just too cute! Thank you for encouraging women to work together instead of working against each other. You always seem to have so much fun! Can you send me some of your energy please? That's a great inteview Margot......it's always nice to learn new things about you!